Okay, Thanksgiving is just a couple of weeks away and the airwaves – or wherever all this internet stuff happens – is burning up with advice on everything from how to fold a napkin in the shape of a turkey, to dealing with Uncle Saul’s bawdy jokes when he’s had one too many toddies. And about pie, of course. A legion of experts have started weighing in on pie in all its minutia, a body of opinion so vast and varied as to leave the home baker’s head spinning. Happens every year, predictable commentary emerging like clockwork. So I thought it might be fun to sort through the fluff and try to make sense of the nonsense, debunk the bunk, and otherwise unpack this seasonal pie luggage and see how it stacks up in regards to the beloved trinity of Thanksgiving pies: pumpkin, apple, and pecan. It’s Thanksgiving, for Pete’s sake, and you’re already busy enough. Nobody’s going to think less of you if you serve a pie made with a packaged crust. They might not think less of you, but your pies won’t earn their undying admiration – nor you your pie chops – if you default to Pillsbury in a package. If you’re waist-high to a kitchen counter and you haven’t learned to make a pie crust, it’s time to woman up/man up and do this thing. It’s just flour, fat, and a little water you’re handling, not a nuclear weapon. Roll it out as best you can, and if it looks like your 4th grade paper-mache project after you get it in your pan, so what? – you gave it your best shot. Never apologize, and train the sharpest of evil eyes on any smart aleck who utters an unflattering word. Don’t worry about perfect: you’ve made your pie crust bones. 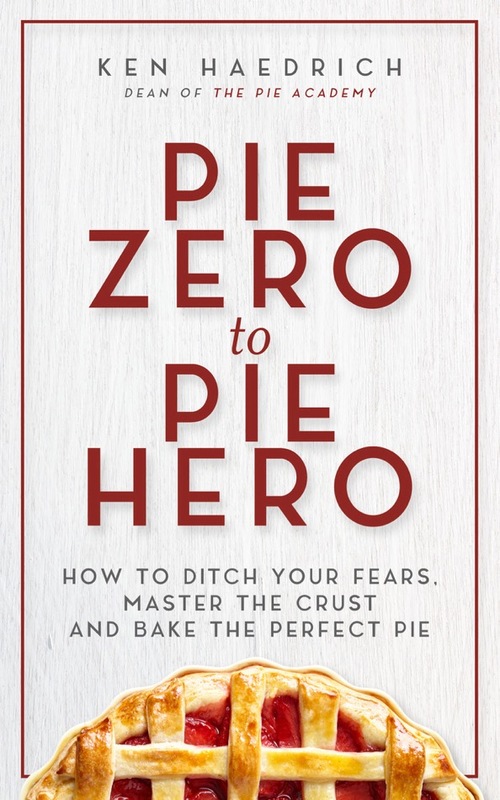 If you need some guidance, click on the Table of Contents tab above, scroll down to the pie crusts, and see which one appeals. We know you’re pressed for time, so don’t worry about prebaking your pie shells for your pumpkin and pecan pies. Your pies will be fine. NOT prebaking your pie shells for these classics is the cardinal sin of Thanksgiving pie making. Your guests eat pumpkin pie what, maybe once or twice a year? When the weather turns and there’s a nip in the air, fields of orange orbs occupy their dreams in anticipation of the moment when that first creamy bite brushes their lips and transports them to pumpkin pie nirvana. Bummer if the only thing they remember about that bite is a crust with all the crunch of a wet lasagna noodle. 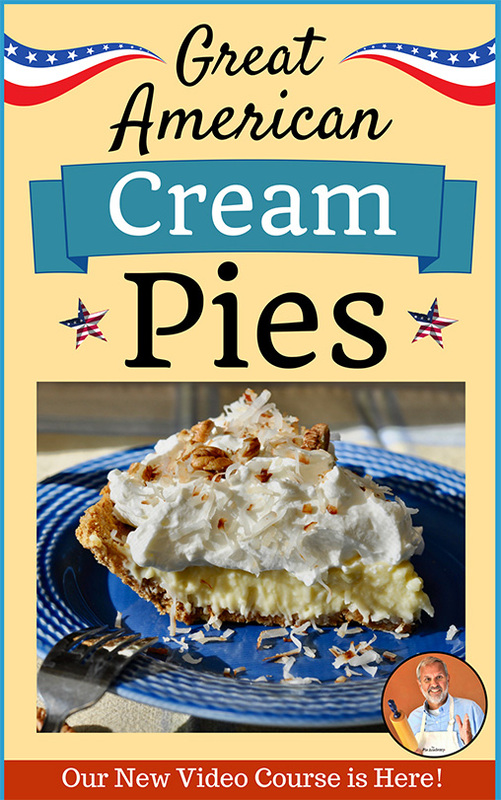 So please, prebake those pie shells. 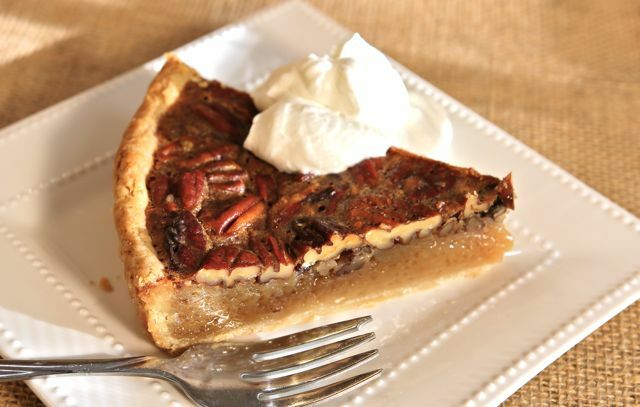 You need that little bit of bottom crunch to give your pumpkin and pecan pies street cred. If you’ve forgotten how to do it, read this recipe and article to brush up. Your pumpkin and pecan pie crusts will always come out better if they’re prebaked, like this one here. 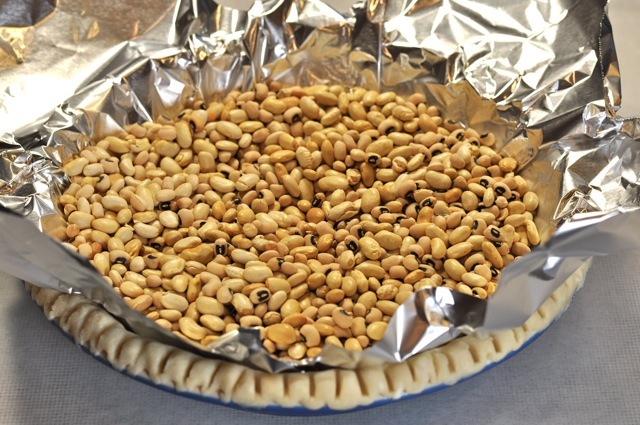 The best way to prebake your pie shell is to line it with foil and weigh it down with dried beans or pie weights. Foil and beans are a good start, but you need a little more insurance to keep your pie shell from slumping and misbehaving. Pie shells that shift, slump, and otherwise misbehave are pretty common; the foil and beans will only get you so far. Try this, too: First, give your pie shell plenty of time to chill in the fridge before you prebake it, at least an hour or two. Second, prebake the shell longer with the beans in it, so it can fully “set in place” before you take them out. Try 30 minutes at 350°, then remove the foil and beans and bake 7 to 10 minutes longer, to dry out the bottom crust. Finally, if you’re using all butter for the fat, substitute one-third Crisco for an equal amount of the butter. Crisco acts like a muscle relaxer on your crust and it really helps. 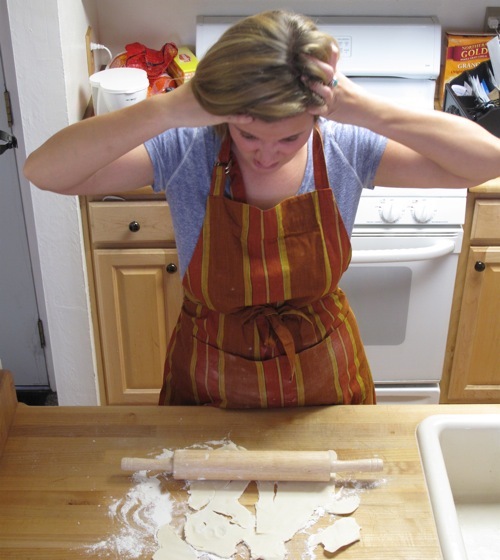 It’s a cinch to roll out homemade pie crust. Just be sure you chill the dough first. Chilling the dough is just one piece of the rolling puzzle. And it’s not a cinch if you’ve never done it before. Having taught and watched thousands of home cooks grapple with pie dough, I can assure you that rolling it out doesn’t come naturally to many. 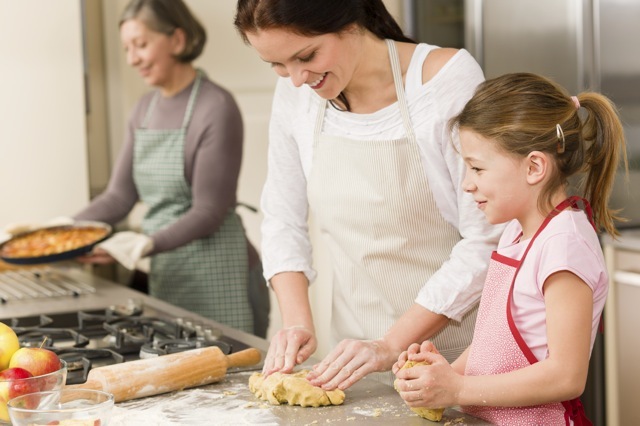 It takes practice to develop a feel for the dough, know how much pressure to use, keep it reasonably round, and prevent it from becoming One With Your Work Surface. It also helps to watch someone who has done it before so you can absorb, by osmosis, the nuances you’d otherwise have to discover on your own. That said, for the first time ever, and in the spirit of Thanksgiving for all of you who support The Pie Academy, I’m unlocking this bonus video from The No-More-Tears Pie Pastry Course, so you can watch me roll a round of dough and get it into the pan – one of 20 videos in a course that’s helped more than a hundred Pie Academy members become crack pie makers. I hope you like it and learn from it. 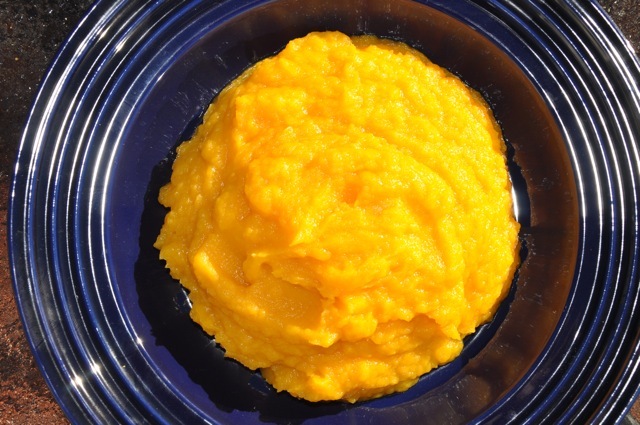 Start with freshly baked pumpkin and homemade pumpkin puree. That’s the secret to the best pumpkin pie. Maybe. But that home-baked pumpkin flesh is full of water and – the real secret, if you want a superior pumpkin pie – is to drain it off. See these two photos below? The top one is 1 3/4 cups homemade pumpkin puree made from a good size pie pumpkin. The bottom one is all the liquid that drained off after the baked-and-scooped pumpkin flesh sat in a strainer for a few hours, about 3/4 cup. 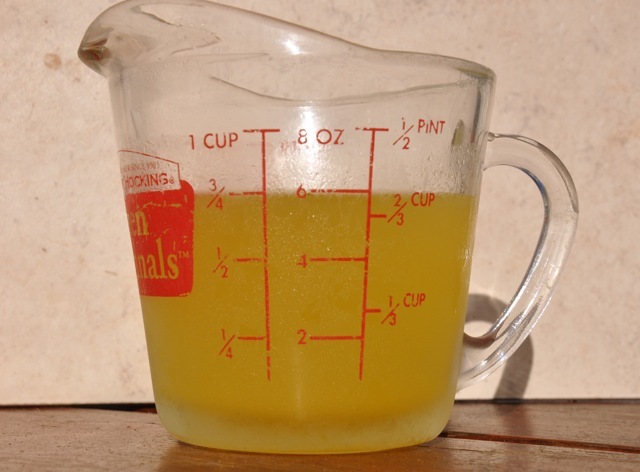 You want all that extra liquid in your pumpkin pie? I don’t think so. 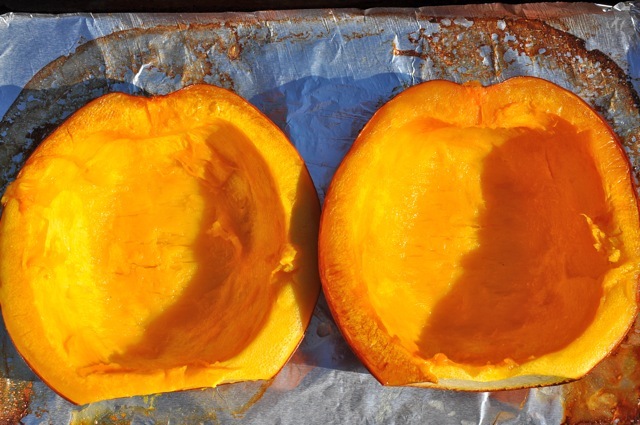 Incidentally, if you’re a little rusty on pumpkin baking basics, here’s how to do it. Rinse the dirt off a good-size pie pumpkin, one about 9- or 10-inches from top to bottom (not counting the stem.) Halve it, remove the stem, and scoop out the goop and seeds. 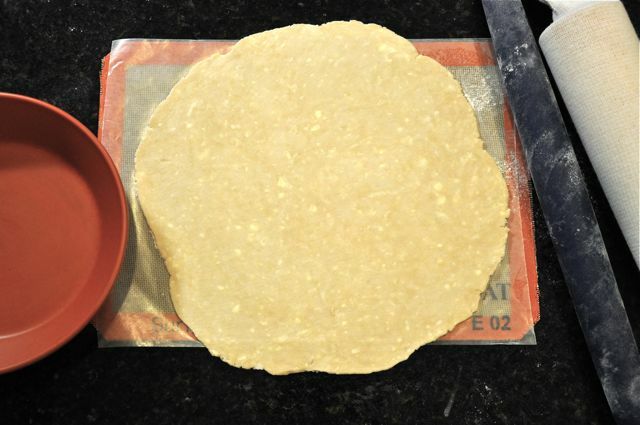 Place cut side down on a large rimmed baking sheet lined with greased foil. Add about a cup of water for nice steamy baking. Bake in a 375° oven for about an hour, until very tender when pierced with a knife. 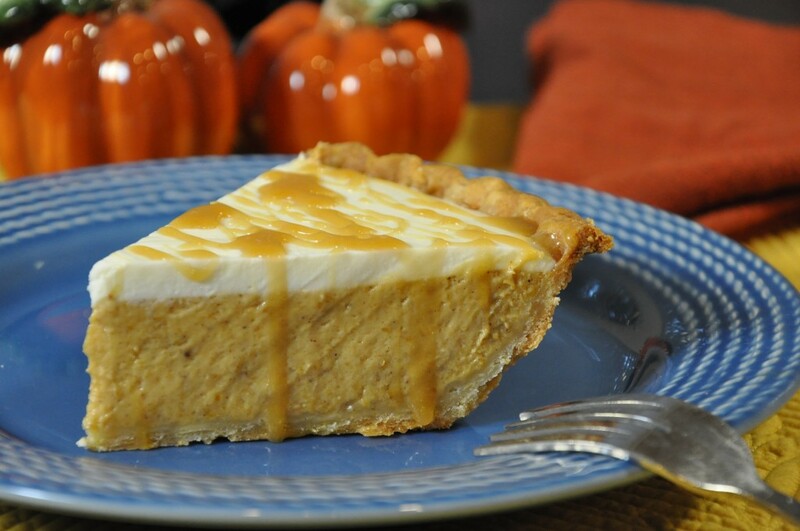 Some Thanksgiving pies will freeze well, but pumpkin is not one of them. Don’t freeze it. Freeze pumpkin pie? Never tried it. Ideally, the best time to make pumpkin pie is the day ahead, then refrigerate it overnight; the flavor and texture are improved by this respite. And it is true that if you bake and then freeze pumpkin pie it can turn weepy when you thaw and serve it. But here’s the thing: you can skirt the issue almost entirely if you make a rich, cream cheesy pumpkin pie like this one here. Pumpkin pie that’s high in fat is much less likely to weep when thawed; it’s just the nature of the beast. Thaw it slowly, moving it to the fridge 12 to 24 hours before you plan to serve it. Add the sour cream topping about 4 hours ahead of serving. Serve cold or cool. If your pumpkin pie cracks, don’t worry. Just cover the crack with whipped cream and you’re good to go. Avoiding those cracks altogether is not as difficult as you might think. 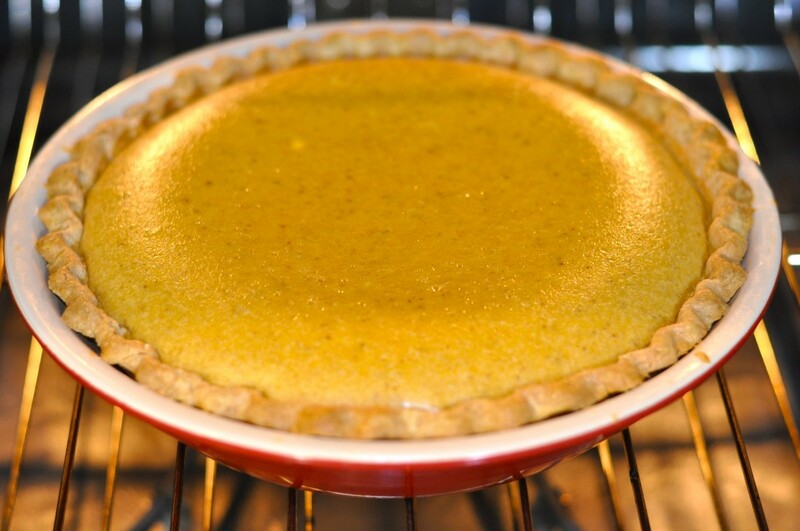 Pumpkin pie is a custard pie, one with an egg and milk product base. And custard pies like to be coddled. Low and slow baking is key, as is a slow cool down. Treat your pumpkin pie more like a cheesecake, and avoid overbaking, and cracks are less likely to occur. When the pie is just done it will jiggle en masse, with no soupiness in the center. It may puff a little around the edges – like in the photo here – but avoid a big puff up. Immediately turn off the oven, open the door part way, and pull the oven rack out a little bit. Cool the pie this way for 20 to 30 minutes, then transfer to a cooling rack and leave at room temperature, not in a cold mud room or on the windowsill (that’s fine for fruit pies.) Same routine for sweet potato pie. Nothing glams up your pecan pie better than chunks of bittersweet chocolate or a slug of bourbon in the filling. You can add chocolate and booze till the cows come home, but let’s not overlook the obvious first – the pecans – for adding flavor. We’re talking, after all, about a pecan pie first and foremost, so how about we toast the pecans and tease out all the pecan flavor that we can? But won’t the pecans toast while they bake in the pie? Maybe a little, but just the part that sticks up out of the lovely gooey filling. What you want is a nice, overall toastedness. Spread the pecans on your baking sheet, preferably not a dark one, and put them in a 325° oven for 7 to 8 minutes. The moment you see they’ve turned one shade darker, get them out of the oven and tilt them off the sheet and onto a counter so they don’t over-toast from residual heat. Chop (or not; that’s a whole other story) and you’re good to go. 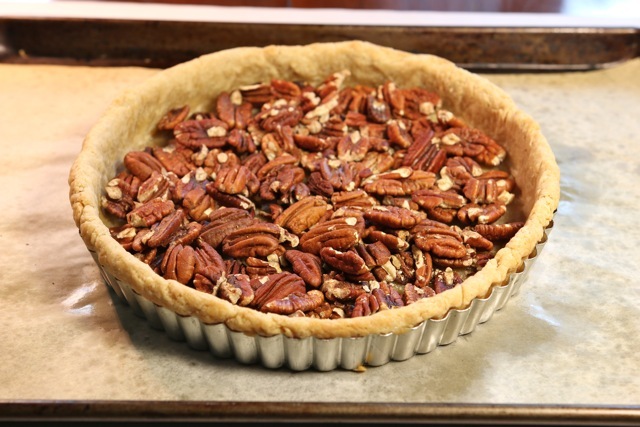 Bring out the best in your Thanksgiving pecan pie by lightly toasting the nuts. Your Thanksgiving Day apple pie will be only as good as your apples. So go find the best ones that you can. They’re as confused as you are by the dozens of apples in the market, including which ones make the best apple pie. Good apples are important to your apple pie, no doubt about it. But finding “the best ones” is a scavenger hunt which on any given day – pardon the pun – may or may not bear fruit. Oftentimes, variety is less important than freshness, but it’s seldom obvious which apples are fresh, local, or otherwise superior. My advice: go to a farm where they grow ‘em, and tell them you want good pie apples. That said, the best hedge against an uncertain apple pie outcome is a measure of boldness: more spice than usual, some brown sugar to deepen the flavor, fresh lemon zest and juice, maybe a tablespoon of pure maple syrup. You’ll taste the difference. 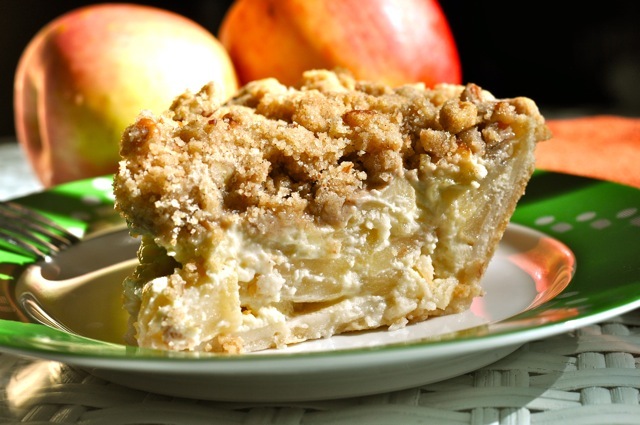 And by the way, this Pennsylvania Dutch Sour Cream Apple Pie is no slouch in the apple pie category. 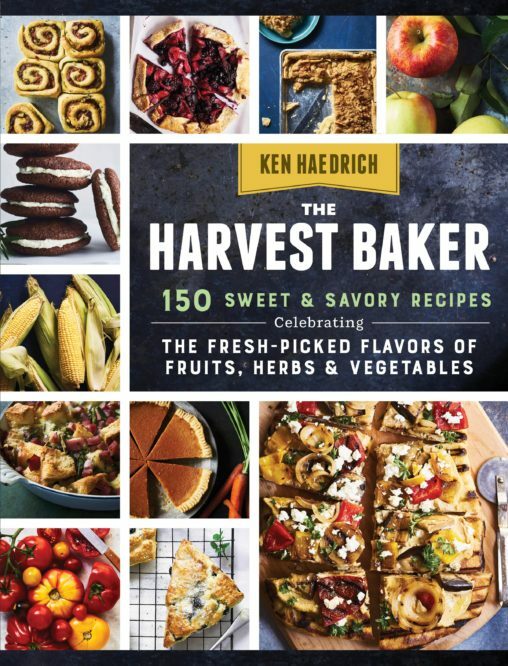 If you’re bored with the same old Thanksgiving pies, mix it up this year and serve something unexpected like chocolate cream pie or salted caramel peanut butter and bacon pie. 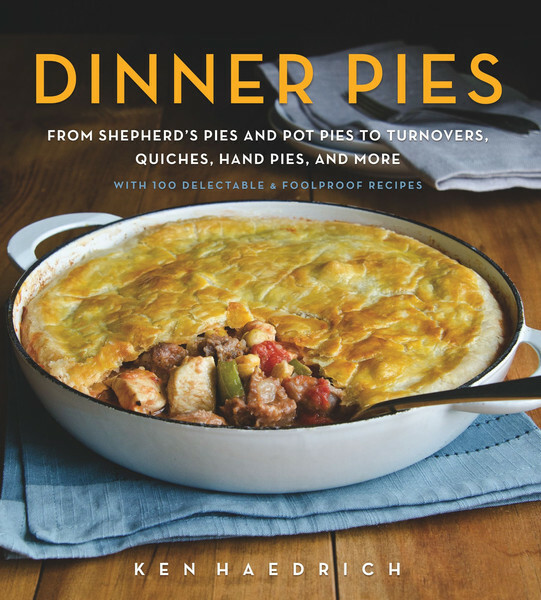 If you’re bored with the same old Thanksgiving pies, you’re probably working with boring recipes. Thanksgiving is no time to go renegade with dessert. It’s the most traditional meal, on the most traditional day of the year, and a peanut butter and bacon pie is only going to make you the centerpiece of family lore for years to come, and not in the way you might hope. Step on tradition’s toes if you like, but don’t kick him off the dance floor. This is no time to skimp on sugar, butter, eggs, vanilla, nuts, calories, whipped cream and ice cream. If you’ve trimmed the good stuff from your pie recipes over the years, in deference to one fad or another, Thanksgiving is the one day you can slap it back on with a clear conscience. Go bold, or go home.